This was an unusual talk, in that it was for the Athens open data community and that city's ODI node. So the audience was more varied than is often the case. I began, as usual with the picture of TimBL and the original diagram, then the Team picture which I use to talk about the variety of work at W3C. The car is a reference to things like the work Web APIs in cars, geospatial data, Web of Things and more. Then a run through the 5 starts of open data - what does each star actually mean and why is each stage better than the previous one. I always emphasise that 3 stars is good. The Prescription Analytics story is always good - and it's based on only 3 star data. It famously shows where doctors in Britain prescribe the expensive, branded statins and where doctors predominantly prescribe the much cheaper generic versions. Since medicines in Britain are subsidised (free for many people and a fixed fee for paying adults), the savings to the NHS brought about following the publication of this one visualisation have been enormous. Then we're in to 4 and 5 star data. I compared the UK, French and Greek published data about bathing water. The UK tool uses 5 star data, linking to the Ordnance Survey mapping data (the national mapping agency) as well as other data. It can easily be updated and augmented. The French version is very good but only uses a relational database and so is less flexible and doesn't link to other data. The Greek publication is an annual PDF. The final picture is a reference to the spatial data work that was just gettinbg under way at the time. An enduring memory of this talk was that I really didn't want to do it, but I was asked by my friend Nancy Routzouni when I was in Athens in January and I couldn't say no. I remember that there was an earth tremour during our conversation which phased her not a jot. I had a meeting in Brussels the previous two days (the Big Data Europe kick off) and arrived in Athens very late the night before feeling very unwell. Stasinos Konstantopoulos from NCSR Demokritos, who I've known for years, had a lot of trouble finding my hotel and drove round and round for ages with me feeling more and more green. Thankfully a night's sleep and I was fine. This was a meeting of the UK Geospatial Standards Forum, a new body established by Peter Parslow of the Ordnance Survey in 2014. It fitted in well with the launch of the Spatial Data on the Web Working Group, a collaboration between W3C and OGC. Preparing for this talk gave me some slides and material that proved very useful on later occasions. The talk begins with a credit to the SmartOpenData project under which the 2014 Linking Geospatial Data workshop was organised. The conclusion of that was that OGC and W3C needed to work together. That took a lot of doing with Denise McKenzie and I spending a lot of time convincing our respective organisations that it was worth it. All of which ended well with the press release of 6/1/2015. After going through the deliverables of that WG and some of the people involved, I get into the Cliffs of Moher sequence. The Cliffs of Moher, part of the Burren Geopark Park, is a dramatic and beautiful site of global importance to geologists (they're formed of Ordovician sediments). Unlike the UK, Ireland has no 'Right to Roam,' meaning that there is no network of footpaths that landowners are legally obliged to maintain. If a landowner doesn't want a footpath, they don't have to have one - and most don't. Therefore, the number of paths in ireland is very small and those that do exist are very heavily used. i.e. there are lots of data points related to this one site - and of course there are many more such places around the world. Hence the need for things like the Spatial Data on the Web work, and projects like SmartOpenData which are about linking geospatial data with other types. 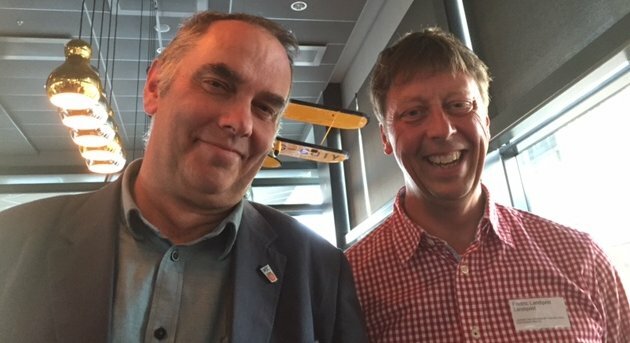 I was invited to Göteborg (Gothenburg) by Frederic Landqvist and Kerstin Forsberg for a Linked Data Day. These events are always a great pleasure to go to as they generally bring together a bunch of very differnet people solving very different problems using the same technology. The danger of group think is ever present of course but you can't help get a buzz out of being part of an exciting community. I was able to use the occasion to promote the Big Data Europe project which provided a framework for talking about current challenges and therefore planned and possible future directions for W3C work. I tried hard to stick to using images rather than text - which lead to some unusual abstractions. Orange with cut out human figure - a reference to the RDF Data Shapes WG and how that's brining in notions of validation and, perhaps, closed world assumptions, to the Semantic Web. Apollo crew - we know the questions. The Apollo astronauts have spent every day since their return answering the same question (what was it like?). We can predict what questions people will ask of a given dataset, so can we pre-compute those and make the answers easy to access? The Linked Data API is a possible way forward. Also, how about extending the functionality of the JSON-LD context file to include queries? (Jason and the Argonauts) Lots of room for query optimisation. Trees. My favourite illustration of a data format. Note that the trees are plantned in rows and are evenly spaced - this is about the CSV on the Web WG, which is nearing the end of its work to define a metadata standard for CSV and processing algorithms to transform CSV+ into JSON or RDF. Leaflets - a reference for how leaflet.js makes it easy to put maps on the Web. We need building blocks. The Shankill Peace Wall. I use this image to talk about the division between Linked Data people and the general Web Develop community. We need to shatter that so that we can see through to the other side. I met Lucy Bell from the UK Digital Service on 25 March at an event organised by the UK Research Councils. The event itself brought together a wider group than already meets in various fora, including the UK Open Research Data Forum (the group convened by Geoffrey Boulton at the Royal Society and chaired by Nick Wright) and, not surprisingly, the discussions were more or less the same with the usual outcomes about the need for carrots and sticks to change the culture among the researchers to make data more intelligently open. I admit I hadn't realised that the UKDS has a base 'just down the road' in Colchester so it was easy to arrange a date to go and visit. TimBL (circa 1991) and figure 1 from Information Management - A Proposal - the original proposal for what became the World Wide Web. I emphasise that everything in the diagram - documents, people, experiments etc. - all have identifiers that are URIs. From day 1, the Web is about links. The W3C team photo from 2013. I talk here about what the Web is now, highlighting people concerned with different aspects like security, accessibility, mobile etc. 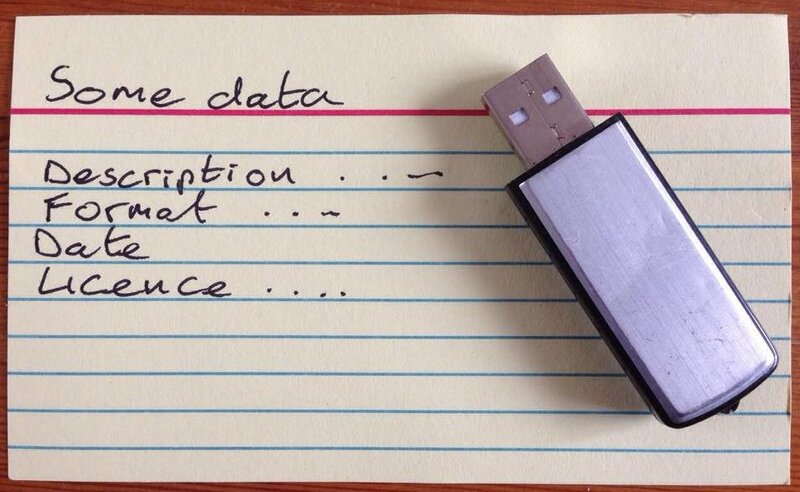 The image of a USB on an index card is used to say that a lot of data is shared online but it's done in such a way that you could just as easily put the data on a USB stick and pass it over. There's no 'Webbyness' about the data. The metadata, maybe, but the data itself is in a little package that you're supposed to download and process off the Web. Nothing wrong with that per se, but it's not data on the Web. The next picture shows terraced houses in a very typpical English street (this one is in Lichfield I believe). Here I talk about all the things that might be relevant: was the light snow forecast? It looks like people weren't inconvenienced by it but how much snow does it take to cause problems at rush hour (in Britian, very little). Who lives here? What is the relative energy consumption in those houses? There's a train crossing the bridge in the background - is it on time? Where is it going? How does the railway affect local house prices? and so on. All those things can be connected via the Web. All of which leads to my explanation of what Linked Data is. And then there's some basic info about the data Activity. For the record, the idea of the USB stick on an index card was mine but I credit Rosie Sutton as the photographer. She's an artistically very talented young person who did a much better job of taking that picture than I managed - I tried several times but she got it right first time. She questioned why there was no ellipsis after the word 'date' - sheer incompetence on my part (I hadn't even noticed). At the time she was my son's girlfriend. What W3C is, the original picture being about links. The glorified USB stick image. Terraced houses - we could link people, and housing, and weather, and the tran in the background, and healthcare. and schools and bin collections etc. general stuff going on in the Data Activity. What we might do/encourage in the forum. One take away was that I got an action item to look into what the forum could/should so in terms of encouraging better use of technology. As an aside, I'd given more or less the same talk a few days earlier when I visited Lucy Bell and her colleagues at the UK Data Service at Essex University. An early session at the Geospatial World Forum that I did with Bart De Lathouwer talking about the OGC/W3C collaboration. Slide deck re-uses the Einstein sculpture sequence to introduce Linked Data. Between this talk and the one 2 days later at the same event I had to 'pop over' to Barcelona for a workshop with GS1. A busy week. This was a short contribution to a session the SmartOpenData project shared with GeoKnow. Martin Tuchyna (of the Slovak Environmental Agency) organised and lead the SmOD half of the session. My role was to talk briefly about the work done on creating RDF vocabularies for INSPIRE. Miss Globe and Mr Cube as examples of the 2 world views we're trying to bring together. 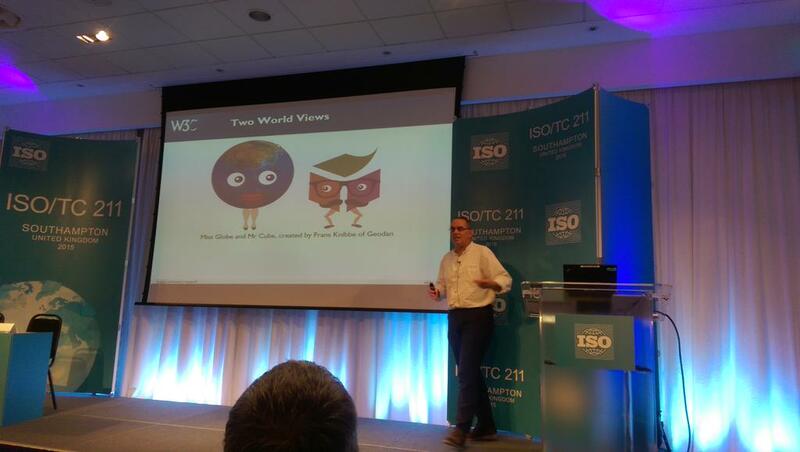 I talked briefly about W3C's liaisons with other ISO groups but main focus was on the collaboration with OGC. UCR doc due for publication imminently - two examples given. Geoscience Australia's ARG25 service that offers Landsat images. All very nice but use by web developers has been limited/ disappointing. Recent video presentation by Leaflet.js creator Vladimir Agafonkin gives good insight into how devs think. Rant about (not) using the Web and why URIs are best (they're a string, so you can use them as a string but you can still pick them up and do stuff with them; content negotiation; parameters for your server side software etc. West Ireland use case from SmartOpenData - want to link places to the people who live there and use it. GIS and the Web – what's the problem? Overview of W3C activities (not everyone knows what W3C is). Background on the Linking Geospatial Data workshop. The Miss Globe/Mr Cube image to show differences in approach → the collaboration with OGC. Brief rant about using the Web as a glorified USB stick. This section cut down significantly from planned version which was unnecessary (lots of SemWeb people in the room). Brief overview of work in SmartOpenData project on creating simplified RDF vocab for INSPIRE. End sequence around linking tourism/people to natural site - i.e. the point of the SmartOpendata project. I've been thinking for some time that I really should make screencasts of my talks rather than just point to slides that rarely convey the whole story (or even part of the story if I just use pictures, as I increasingly do). So this was an attempt to have a go. The main problem is finding suitable software. Or rather, finding suitable free software. I really should pay for a package so that it becomes easy to record and edit online versions of my talks. Anyway, this was a first dipping of a toe in the water. The talk is an overview of what's happening in the data Activity, i.e. current and possible future working groups etc. The talk reused a lot of the slides and ideas from previous occasions including the USB stick image and the picture of a suburban street to talk about all the different things that can be said about something/somewhere. 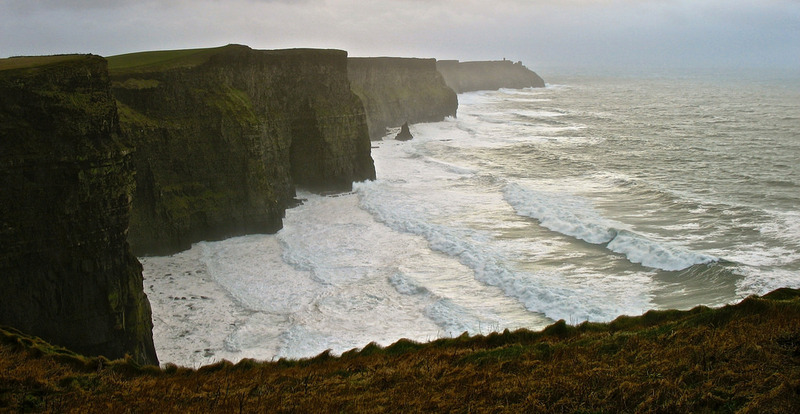 It ends with the Cliffs of Moher sequence which is very much driven by the SmartOpenData project.